AGRO INFOMEDIA SERVICES providiing agriculture services with a dedicated team to all your needs providing efficiency, quality and service since last 5 years. In an age information is power, business,depends on competition and competitivess Runs on the fuel of information.AGRO INFOMEDIA SERVICES Amis to fulfill Information needs of consumers,suppliers and producers in the field of agricultural Business and its allied activities in Maharashtra state. 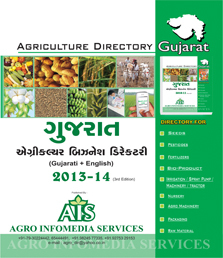 MAHARASHTRA AGRICULTUR BUSINESS DIRECTORY 2011-12 the Edition of AGRO INFOMEDIA SERVICES, Ahmedabad of agricultural business directory of Maharashtra will be published in may,2012.this updated new edition will include More information such as email address, mobile no,web-site,mobile no etc.looking to the needs of the day in a most comprehensive manner. AGRO INFOMEDIA SERVICES is a leading Agro services Company that has introduced the concept of Agro directory in Gujarat and maharashtra. This chain of agro centers served as one stop shop for farmers by providing Agri-Inputs, Farm Machinery, Cattle Feed and other agri allied products. Under the umbrella of services, company provides agronomic services including soil testing, crop inspection, weather forecasts and advisory services on farm credit, crop loan, life insurance and medical Insurance etc. The company is pioneered in providing quality fresh produce to the market through its subsidiary Agro infomedia services and has diversified itself in the line of Contract farming for Baby corn, Banana, Pomegranate and other Horticulture products as well as wheat and oilseeds.